Today’s guest post is by the Rev. Joel Edwards on behalf of the EXPOSED Campaign. Joel is the International Director for Micah Challenge, a global Christian response to extreme poverty. Prior to his role within Micah Challenge, he was General Director of the Evangelical Alliance UK. Currently Joel is an Advisory Member of Tony Blair’s Faith Foundation. He also serves as a member of the Advisory Board on Human Rights & Religious Freedom with the British Foreign & Commonwealth Office and is a regular broadcaster with the BBC and other UK and international media channels. Micah Challenge, EXPOSED and Joel Edwards can all be followed on Twitter. If at the birth of Jesus, you were given 1 trillion U.S dollars and spent 1 million dollars every day since then, you would still have 213 billion dollars left. 1 trillion dollars, that is how much money is paid in bribes each year! A quarter of Africa’s GDP ($150 billion each year) is stolen from African economies by corruption. It is the poor and vulnerable who suffer most from secret and corrupt deals as the rich get richer and the poor get poorer. It’s not just money that is lost though: corruption kills. The lives of 230 children under the age of five could be saved every day if the issue of tax evasion is addressed. Corruption is active at all levels of society. It ranges from families in developing countries having to pay bribes to go to school to a lack of transparency in extractive industries. From paying to give birth in a hospital to large companies not declaring profits and hiding assets, corruption has simply become a way of life. We are all implicated. The phones, tablets and laptops we use contain coltan, which is mined in the Democratic Republic of Congo, a country which is torn apart by war and the conflict there is being funded by mined minerals. Injustice is happening in Congo due to a lack of transparency in the production chain of these minerals and our phones, laptops and other electronic devices. We are all implicated in this! Corruption robs people of the fullness of life that God desires for rich and poor people alike. It is a global problem that is crying out for our attention. Our aim is a world free from extreme poverty with our mission to be a global voice for the Church: to educate, inspire and mobilise Christians to bring impact on the issues of poverty and injustice. We spoke to a wide cross-section of our 40 global partners across the globe in 2009 asking what was the one thing stopping them to achieve the Millennium Development Goals (MDGs) set by World Leaders in 2000 and the overwhelming response was corruption. That is what the EXPOSED Campaign is about. We are a coalition of Christian organisations that aim to mobilise churches, governments, businesses and individuals to shine a light on practices that oppress the poor and re-establish integrity in financial and political systems. We are aiming to collect 1 million signatures to hand over to the G20 in Brisbane, Australia in November this year when the world leaders will discuss the international financial system. 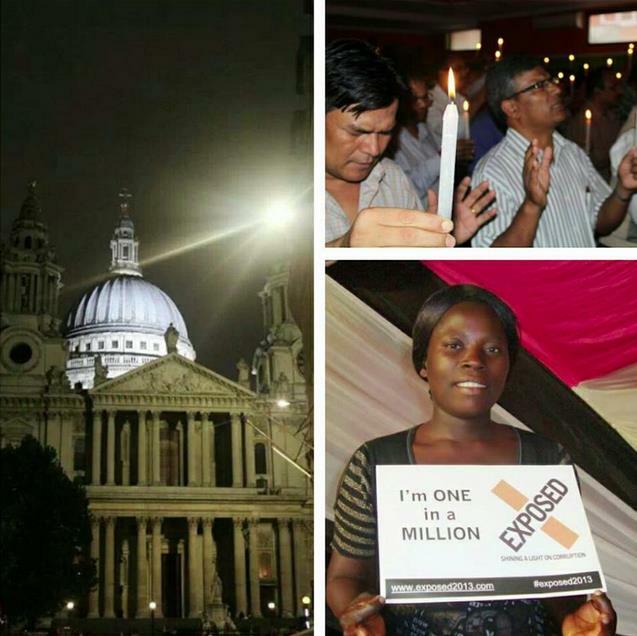 EXPOSED vigils held last October outside St Paul’s Cathedral, in Nepal and in Uganda. Three of hundreds of vigils held around the world. Signatures for petitions do work! The Jubilee Campaign at the turn of the Millennium saw 21 million signatures with rich countries promising to write off $110 billion of debt from the developing world. In 2005 the biggest ever Anti Poverty Movement – ‘Make Poverty History’ saw 444,000 people e-mail the Prime Minister and the 2005 G8 summit signalled an extra $48 billion a year to be spent on tackling poverty. Campaigns can make a difference! That is why we need you to get involved. In October last year thousands across the world gathered together to hold vigils to pray in public for integrity within their local communities, businesses, public services and government. Your voice is a powerful one. As a faith community this is the first global Christian response to corruption and this pioneering campaign is starting to make cracks in the walls that corruption has built. Help us tear down these walls down and shine a light on corruption by being one in a million. Watch the video and please SIGN THE CAMPAIGN! World Bank (2007) Stolen Asset Recover (StAR) Initiative; Challenges, Opportunities and Acton Plan. What a wonderful typo – “1 trillion dollars, that is how much money is paid in brides each year!” But more seriously, thank you for this post – I have signed the petition – and indeed for so many helpful, thoughtful and informative posts. Thanks George. The typo was quickly spotted and corrected, but only after publication. Proof reader, i.e. me, got a slapped wrist for that one! There is a curious irony in the world and that is, in the main, religious countries (regardless of the religion) tend to be countries where corruption is rife. And this is not just something about aid, big business etc. but tends to be part and parcel of life. Birmingham University’s project on Religion and Development provides empirical research which suggests individuals in religious societies tend to have a split personality when it comes to corruption – it’s something other people do, even though they engage in corruption and even religious people are able to have a pragmatic view of corruption and use it to their own benefit or see it just as part of how you get things done (see: http://www.religionsanddevelopment.org/files/resourcesmodule/@random454f80f60b3f4/1274702497_Working_Paper_42_complete_for_web.pdf for a further discussion). Back in the 1980s when I worked and worshipped at an Evangelical Anglican church, I shared a flat with an embryo cleric who berated me when I showed signs of dabbling with liberal ideas. He stated that British Anglicans needed to look to the developing world and Africa in particular, where, he claimed, there was a strong sense of religious orthodoxy (of course this is just a species of middle-class white, patronising racism, but I didn’t realise this at the time). Jump forward a few decades and he and his wife and children went out with CMS to work at a theological college in a sub-Saharan country. They returned a year later (cutting short their contracted time in Africa by several years) rather disheartened – indeed they have since distanced themselves from Evangelical Christianity. They found a goodly portion of what they had presumed would be orthodox, conservative Christianity was just an obsession with outward appearance, that didn’t permeate to the daily life of many of their students. My friend later travelled to Nigeria on church business and was coolly offered a bribe to try and wrangle an English diocese to choose a Nigerian computer company, based in London, the next time it was looking to renegotiate its IT contract. The person offering the bribe was a Nigerian Anglican minister. My friend’s faith in African Christian orthodoxy crumbled further! At the same time, I had been working in London as a social worker and had noticed that many of the conservative African Christians I had worked with (both as colleagues and clients) tended to place a high value on outward appearance which often didn’t extend to their personal behaviour (particularly around honesty, finance and heterosexual sexual mores). I was pleased to note that the Revd John Richardson (Ugley Vicar) had had a similar experience (as he writes on his blog ‘I used to be on the staff on an east London church with a very large African population. Theological conservatism was commonplace (and nothing wrong with that – the Creeds are pretty conservative) but in so many ways (and not just in sexual morality) this did not permeate to life practices.’ – see: http://ugleyvicar.blogspot.co.uk/). The very fact that religious societies are often more corrupt societies suggests that religion itself is not a guard against corrupt behaviour. Personally I am always wary of any society that seems fixated on ‘easy’ morality (usually queer-bashing) and outward appearances – and this seems endemic in much sub-Saharan Christianity. Nigerian Anglicans may be the favourites of certain flavours of British Evangelical and conservative Christians, but Nigeria is also a by-word for corruption in the wider world; my own experiences (see: http://bornagainagnostoc.blogspot.co.uk/2014/01/what-is-truth-negotiable-quantity-in.html) have only confirmed my distrust of overt piety on the part of some African Christians. I’ve had my fingers bitten too often. Therefore I am pleased to read the above, but I would state that we have to accept that religion and Christianity in particular is no guardian of social morality. Moreover ‘he who can be trusted in small things, can be trusted in larger…’ in other words there has to be a real challenge to the outward emphasis of African/developing world Christianity (and religion in general). 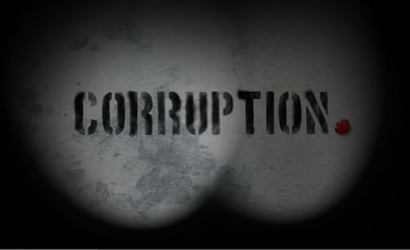 Corruption is seen as something others do or the preserve of big business or dealings with aid agencies. Yet the reality is that it is endemic even in Christian society and it is the emphasis on changing personal behaviour that needs attention. I agree with what you have said and thank you for setting it out in so much detail. Having travelled to Africa several times I too am aware of how corruption is engrained in many cultures including churches. It is a serious problem that holds too many people back and undermines the Christianity they preach. It reminds me of how blind we can be to our failings when Christianity is influenced by culture rather than the other way round. And that applies to all churches without exception. Just one point of clarification. ‘Coltan’ is an abbreviation of (Col)umbite and (Tan)talite which are the main host minerals for Niobiuim (formerly known as columbium) and Tantalum. Tantalum is certainly used in phones as the Rev Joel Edwards highlights whilst Niobium is normally used in alloying steel. The DRC is a small player in the production of Coltan. The main worldwide producers of Niobium are Australia and Brazil, whilst Australia, Brazil and Canada are the major producers of Tantalum. Notwithstanding this the problem of conflict minerals is key and it is normally the use and abuse of artisnal (small scale, local and informal) miners that fuel the conflicts.